Tuesday, October 31st, 2017 at 3:04pm. We are now officially entering the holiday season and in Austin, TX and that means events galore! As we head into November and December there is a lot happening throughout town for everyone in the family from the Texas Book festival to the trail of lights we have you covered. For the 5th consecutive year, old meets new in Austin when more than 400 competitors test iconic racing machines on COTA's state-of-the-art track! Come see some of the craziest, most charismatic and passionate racing to hit Circuit of The Americas this year. Friday, October 27th, 2017 at 2:41pm. The University of Texas at Austin was named as the top University in the state of Texas and 32nd in the world! Out of 1,250 institutions in 74 countries, the university was ranked No. 32 in the world, beating out schools like University of Copenhagen (No. 37); Kings College London (No. 41); University of Tokyo (No. 57); and, yes, University of Maryland, College Park (No. 50). Thursday, October 26th, 2017 at 11:01am. The events that are held yearly around the area are some of the main things that make Austin so attractive to visitors and those choosing to move to Austin. Almost all events include live music, keeping with the slogan, "Live Music Capital". From running, boating, reading, listening, eating, and watching to participating and just plain enjoying, Austin has always had a culture of celebrating everything with music. Below is our calendar of yearly events, in chronological order, starting in January. The list includes a link to the event website, a short description, dates (when available) and location. Monday, October 9th, 2017 at 2:48pm. 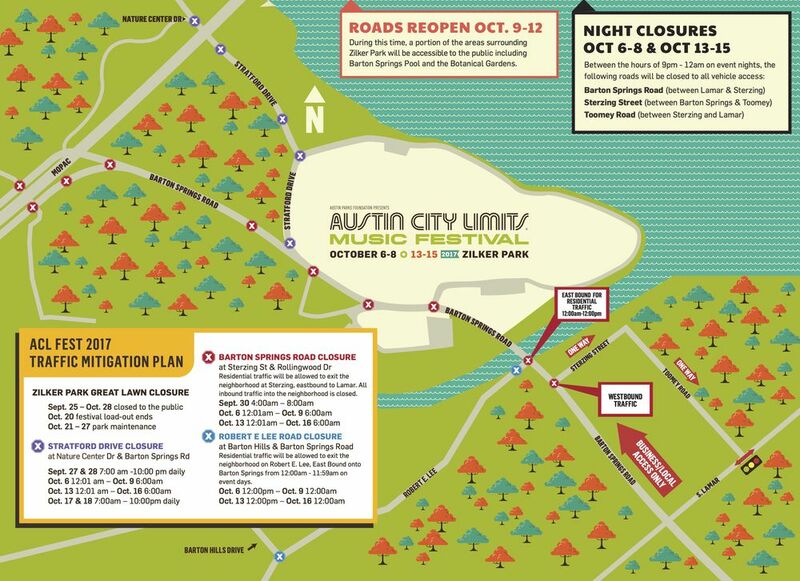 Whether your looking to avoid ACL traffic this week or trying to map out your weekend at Zilker there is a lot of helpful info out there! With the help of some our friends from Austin City Limits Music Festival and Curbed Austin we have put together some great maps and tips. There’s complimentary shuttle bus service from Republic Square Park for attendees, as well as ramped-up Capital Metro service, a taxi stand, and lots of bicycle racks. 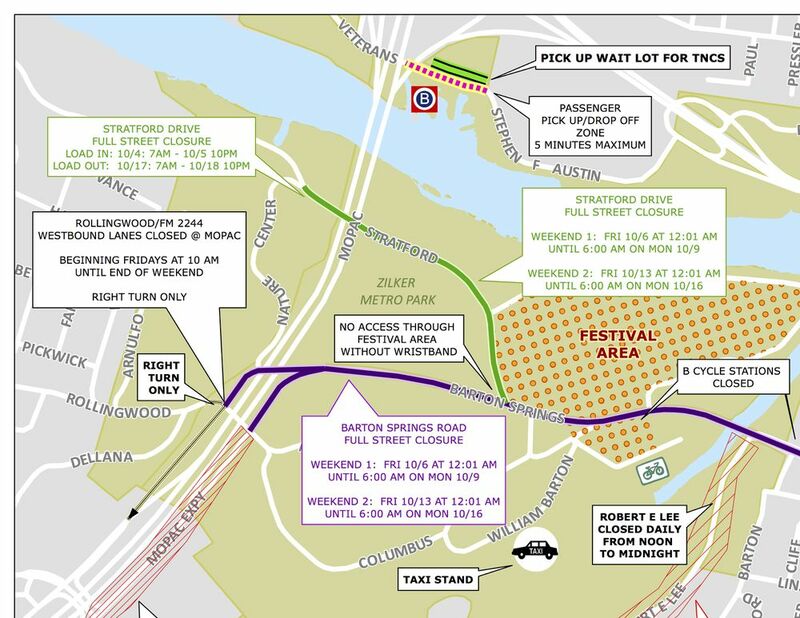 If your looking to avoid all that is ACL and skip the traffic jams here is what you need to know! 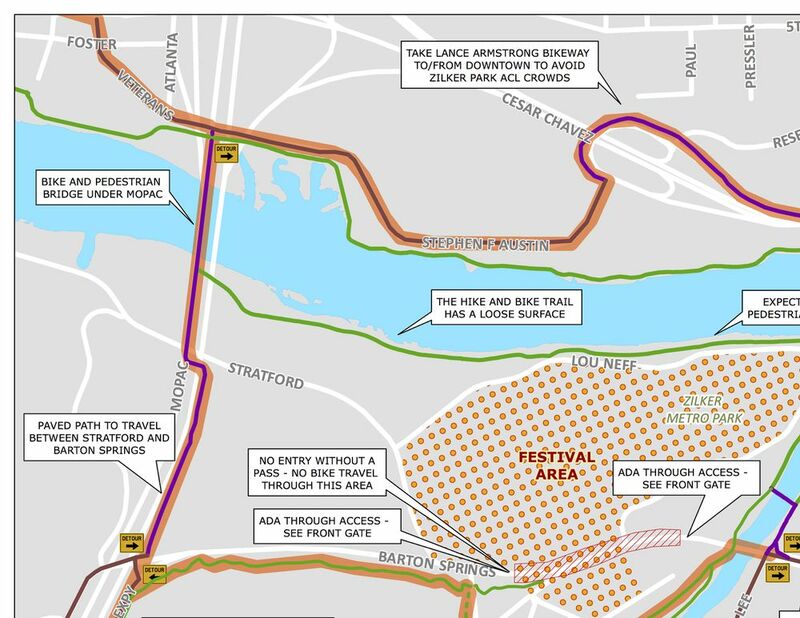 And lastly if your looking to bike or plan where to park to hit the festival here is the info you'll need! For more helpful info visit ACL's homepage here!